The United States launched 59 Tomahawk cruise missiles at a Syrian airfield in Homs in response to what numerous defense officials believe was the intentional gassing of civilians by Syrian leader Bashar al-Assad. According to reporting from The Guardian, U.S. intelligence officials have reason to believe that Russian personnel were at the al-Shayrat airbase when sarin gas was loaded onto a Syrian jet before Tuesday’s reported chemical bombing of the northern-Syria rebel town that killed at least 100 people. Reports from the province after the U.S.’s retaliatory airstrike are that at least six were killed and the airfield in Homs was significantly damaged, according to Navy Capt. Jeff Davis, a spokesman for the Defense Department. In the ensuing minutes and hours, countries such as England, France, Germany, Canada, Japan, Israel, Italy and Turkey came out in support of the limited and targeted strike. 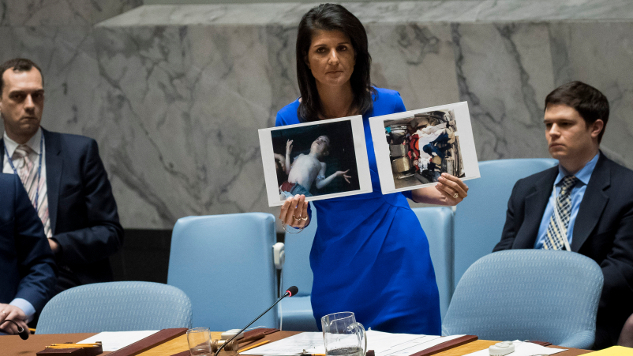 Russia, who has backed the al-Assad regime against rebel groups (such as ISIS), immediately chastised the move (along with China and Iran) and called for a United Nations Security Council meeting, which began at 11:30 a.m. EST. Just what the hell will be (or won’t be) talked about in that meeting has perhaps the highest variance. As mentioned above, China, Iran and Russia have condemned the airstrike. But they’re in what’s rapidly become a vocal minority on the world stage. The Guardian reports that watchdog groups such as the International Committee of the Red Cross have also rebuked the attack, but they don’t have a seat at the table. Jeremy Corbyn, who leads England’s Labour Party in opposition to Prime Minster Theresa May, has said that: “The British government should urge restraint on the Trump administration and throw its weight behind peace negotiations and a comprehensive political settlement.” But there again, he’s on the outside looking in. As clear and direct as what happened last night was, what happens now is far murkier. The unknowns, ultimately, outweigh the knowns.